You’ve tried every shampoo, mask, and texture spray under the sun and, still, nothing seems to cure your dreaded winter hair troubles. No matter how many buzzy products you try, there doesn’t seem to be a fix out there for you—and maybe that’s because there isn’t. You’d happily commit to a custom sofa or coffee table, so why wouldn’t you do the same for your hair? At least, that’s what Prose wants to know. The personalized haircare startup puts customization first, designing products to fit a customer’s unique hair and scalp needs. Not only do clients get a bottle with their name on it, but the brand will even make a formula that’s vegan, gluten-free, or fragrance-free if you ask. Thus, it only seems fitting that the startup’s NYC office reflects its made-to-order motto. Part office, part showroom, and part salon, Prose recently tasked Homepolish designer Tina Rich to turn their SoHo workspace into a breezy beauty paradise. Rich peppered the space with subtle nods to the brand’s ethos, including globe pendants and coat hooks that look like (stand-ins for sudsy bubbles), chairs shaped like drops (of product), and a custom rug that curves like strands of hair. For the overarching color palette, Rich pulled directly from the colors that inform Prose’s packaging and website: dusty pink, dusty green, powdery blues, and rust. In lieu of crisp white walls, the designer opted for a chalky pink paint color and complemented the hue elsewhere with accent chairs, art, and floral arrangements. 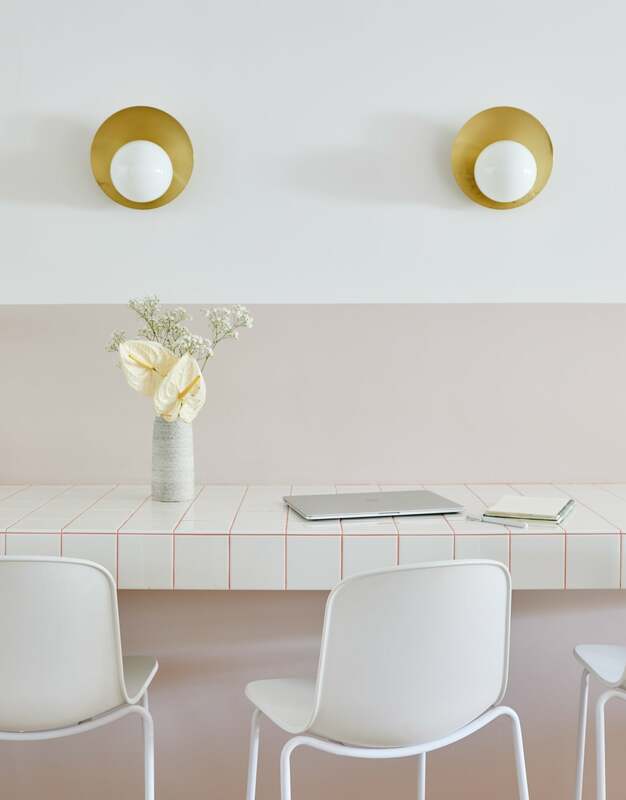 “While I’m over a Millennial Pink, I love the light, dusty pink we used on the walls. It serves as a neutral backdrop for other pops of color,” says the designer. Tiling isn’t just for bathrooms or kitchen backsplash anymore. In the main display area, Rich designed a custom tiled table on two perfectly peach legs to act as a station for hosting tutorials and mixing product. Read between the lines and you’ll notice that the not-so-usual standing desk boasts a special detail. Grout never looked so good. Mirrors are essential to the inner workings of a salon, but that doesn’t mean they have to be boring. Traditional swivel chairs and mounted mirrors have no place here. Instead, you’ll find trendy renditions that fit the brand’s palette to a T.
In order to channel the richly layered displays frequently found in apothecaries, Rich opted for a large metal shelving unit to showcase various product examples. “Because their ingredients are meticulously tested and refined and each haircare product is custom-mixed, we wanted to create a piece that had an apothecary vibe. They wanted the space to not only be a functional office but a lab, salon, and showroom for their clients to experience,” suggests Rich. While there’s still plenty of cabinet space to hide clutter, the central open shelves invite customers to admire. Re-create the same vibe in a bathroom or kitchen with a wall-to-wall shelving unit that lets you adore your prettiest products and glassware from afar.